This book shares the history of cowrie shell divination and shows you how to open the portals of spiritual communication with the shells and related divination systems, such as cola nuts and coconuts. Written by a long-time practitioner, African Cowrie Shells Divination provides the meaning of the sixteen shell combinations as well as tips and variations for readings based on the specific question being asked. Discover the powerful messages of the Orishas and the mystical divination techniques of Candomblé, Santería, and other traditions of the African diaspora. Explore the instructive stories known as patakkís and apply their guidance to your life. The cowrie shells are sacred magical tools. With the history, theories, and hands-on instructions in this guide, you will learn how the shells can be used to answer your most important questions and achieve your true destiny. 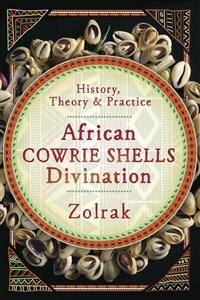 Zolrak is a longtime practitioner of cowrie shell divination and other spiritual traditions of the African diaspora. He is the cocreator of the bestselling Tarot of the Orishas, the first tarot deck based on this theme. Zolrak is also a teacher of Kardecist mediumship and a parapsychologist with a spiritually universalist perspective. Additionally, Zolrak works as a radio and television host. Many people define him with a single word that summarizes his essence: Magician.